Dr. LeRoy Moore will speak about his new, hot-off-the-press book, Plutonium & People Don't Mix. A book signing will follow. Light refreshments will be served. Come meet this remarkable man, who has devoted his life to protecting the health and lives of all who have been impacted by Rocky Flats. Environmental Information Network (EIN), Inc. is giving a presentation of the Marcus F. Church v. United States of America, Dow Chemical Company, Rockwell International Corporation Pre-Trial Statement plaintiff file for Rocky Flats Right to Know February meeting. Everything EIN states is their opinion after researching and working on these issues for over 30 years. One Jeffco Commissioner happened to own some “investment” property that he wanted to develop. In EIN's opinion, the “developers” and the County Commissioners bided their time and “got a couple of their own” into the Commissioners fold. One of which was Mr. Newman who owned a chemical company just south of Rocky Flats (RF) that by the way was doing work for R.F. How convenient! The crux of the Church Lawsuit was that the Department of Energy (DoE) and Dow Chemical and Rockwell International had contaminated the ranch land so badly that the County would not allow them to zone the property for subdividing, leaving the Church –McKay family with worthless property due to no fault of their own. So Marcus F. Church found himself an attorney and sued the U.S. Government and got $9 Million in the end because his land had been so badly contaminated with Pu and Am. Then they turned around and said the property was “below” the Colorado State Standard for Plutonium (Pu) in the soil and it was below that standard. We will talk about the efforts it took to get that Pu tilled into the soil so that could be accomplished. In the meantime the DoE paid for the Colorado Dept. of Health to do a Dose Reconstruction Project and put together a “Health Advisory Panel (HAP)” to do it. 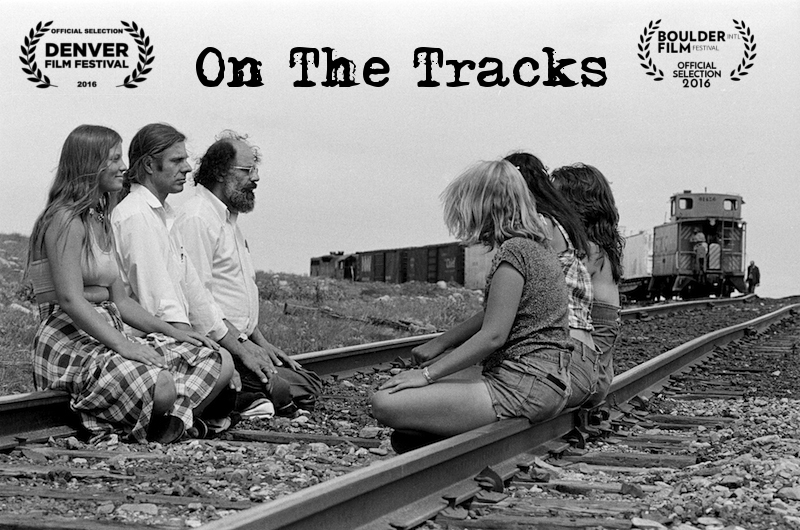 It was during the 9 -10 years of meetings that Paula Elofson-Gardine and Susan Elofson-Hurst attended and participated in these meetings along with Mr. James Stone, Dr. William Kemper, Mr. Gregory K. Marsh, Dr. Gale Biggs, who were part of the Rocky Flats Cleanup Commission with them. This is where the CDH came up with the idea of “revisiting” the Pu Soil Standard by organizing a Citizens Sampling Subcommittee for it. This was from the brains of the DoE, CDH and developers, NOT the citizens that attended the meetings as CDH’s Dr. Norma Morin claimed. Getting the Pu in the Soil Standard raised from .02 d/p/m to that of 2.0 d/p/m is what the new standard was changed to – which took the Rocky Flats Cleanup Commission to be disbanded in favor of the CAB which was headed up by compromised R.F. workers, economic developer interests and “go alongers” to get this done without the usual dissenting voices of reason there to say – this isn’t right. You don’t make a soil standard that is based on what is in the soil; you make it based on human health!! As a matter of fact, the soil from the S.E. Corner of the R.F.P. was used to calibrate equipment. 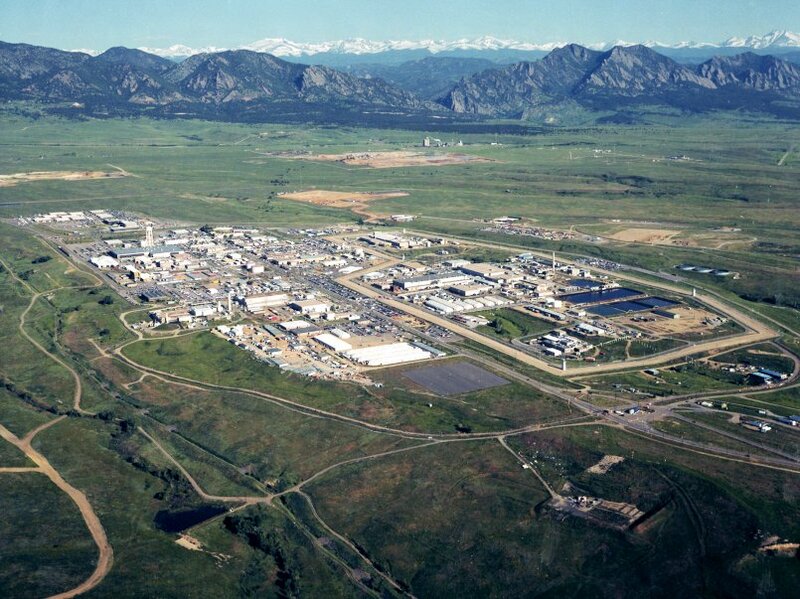 EIN will tell you why the Environmental Measurements Laboratory took Rocky Flats off the International monitoring site. EIN will tell the story about how the Department of Energy, Colorado Department of Health (CDH), EPA, Jefferson County, the Cities of Broomfield and Westminster were signatory to the Settlement Agreement that allowed the Church-McKay family to “leverage” these entities to allow for Candelas to break ground of some of the most contaminated land around – if you don’t count Hanford which has 600 miles of a Buffer Zone. · What happened to the PM-10 Air Monitors that were supposed to monitor the Pu and Am in the soil and air during and after construction? Remember the COMRAD program? · What happened after a Chromic Acid Bath was “accidentally” left on during a weekend that left hundreds of gallons pooled in the environment? 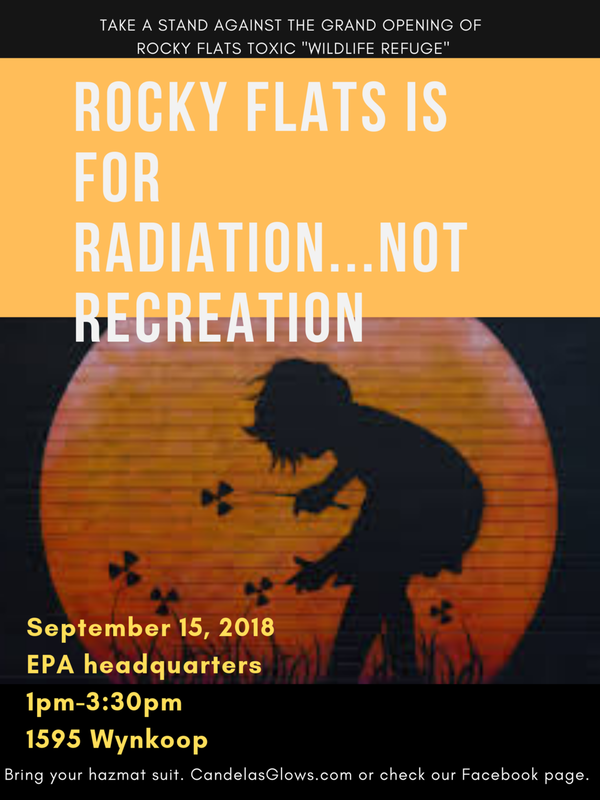 · EPA stated that no contamination went “beyond the fences” at Rocky Flats? · How and why the “Unholy Alliance” of CDH, DoE, EPA, Jeffco allowed construction East and South of the R.F. property. · WHY was the uncharacterized R.F. Buffer Zone turned into a National Nuclear Wildlife Reserve? The story you won’t want to miss! · How was Standley Lake taken off the Super Fund List with no cleanup! Former Rocky Flats Workers will speak about why the “Wildlife Refuge” is not a safe place to recreate. 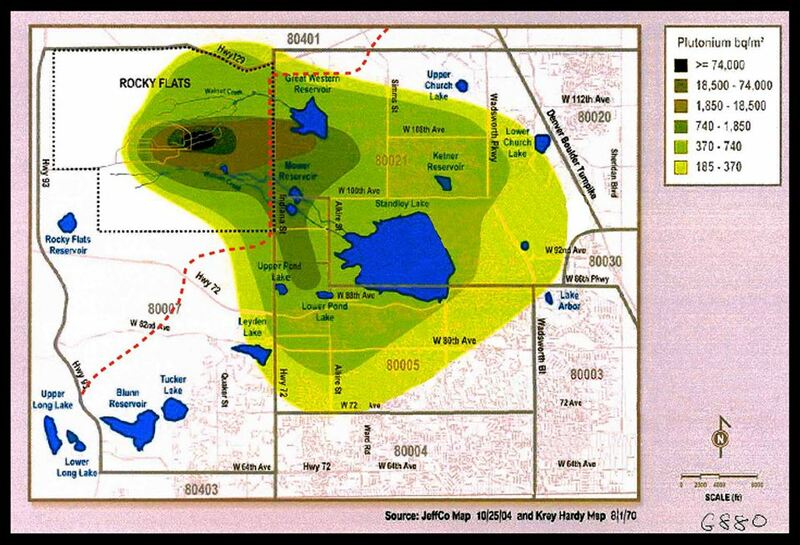 There has been no testing of the Rocky Flats National Wildlife Refuge since 2004. Some areas have never been tested. Former workers warn us of buried nuclear waste on the Refuge, which was the buffer zone for the nuclear weapons plant (the triggers for all the nuclear weapons in the United States arsenal were made there). The "cleanup" was of the plant site itself, which remains a nuclear Superfund site. There was no cleanup of the Refuge. This is immoral and unjust and will impact human health over the coming years. The problem is radioactivity, not radiation. The plutonium can't be detected with a Geiger counter. Kristen Iversen, author of Full Body Burden, Growing up in the Nuclear Shadow of Rocky Flats, will speak and sign books. Please attend this public meeting. Be informed. Public comment is taken. Please attend. $6 million of our money has been spent over the past 10 years ($2 million each Arvada, Jefferson County, and City and County of Broomfield) toward building a private tollroad that would disturb contaminated dirt east of the former Rocky Flats plant along Indiana. Join us June 27th to hear from Rocky Mountain Peace and Justice members about their recent "DC Days" trip, which included meetings with Colorado representatives, Department of Energy Representatives, and US Fish and Wildlife. Learn where those representatives stand on opening the Rocky Flats National Wildlife Refuge, and how you can take action to help us keep it closed. Our May meeting will focus on water issues. The former Rocky Flats Nuclear Weapons plant has long affected local water and continues to do so. The JPAC meets on the third Thursday of the month at 6:30 p.m. at the Apex Field House located at 5724 Oak St., Arvada 80002 and is open to the public. The May meeting will include presentations regarding potential health risks pertaining to the Jefferson Parkway. Please attend the Board meeting of the JPPHA at Arvada City Hall. They will start with Executive Session at 3 pm, and the public meeting will follow. Millions of dollars of taxpayer's money have been spent, and spending continues on this proposed tollway that would disturb the contaminated dirt along Indiana Street east of the former Rocky Flats Nuclear Weapons Plant. Randy Stafford will present a review of a dozen studies of offsite soil contamination around Rocky Flats that all show plutonium concentrations of hundreds of times background radiation, and he will present a review of the precious few public health studies conducted over the course of Rocky Flats history, showing greater cancer incidence in the downwind population. Randy has researched, collected, and compiled this information over this past year. To obtain copies of these studies, Randy has made FOIA requests of the Department of Energy, visited the Federal Records Center in Broomfield, the District Court clerk’s office in downtown Denver (to review documents from lawsuits against Rocky Flats), spent two weeks combing through the CU library’s special collections of files donated by Drs. Ed Martell, Carl Johnson, John Cobb, and LeRoy Moore, and obtained rare documents from those sources and from Paula Elofson-Gardine of Environmental Information Network. The conclusions of these studies are as consistent as they are damning: there IS offsite plutonium contamination from Rocky Flats, and there IS higher cancer incidence in the downwind population. Lynne Collins, director of All My Sons, will tie the play together with Rocky Flats issues. Rocky Flats panelists include David Snow, PhD, Pat Mellen, Ted Ziegler and LeRoy Moore, PhD. Contact Manuel Gomez, 720-898-7273, at the Arvada Center for the Rocky Flats Right to Know group ticket price of $25. Major credit cards accepted except AMEX. Limited seats are available, so if you plan to attend the play, please buy your tickets by February 11th. The panel discussion is free and open to the public. Our February meeting will feature Sasha Stiles, MD, who is working to safeguard the health of residents in our Downwind population from past and future offsite contamination from Rocky Flats. She will give a short talk: a physician's take on the science of one specific cancer known to be radiosensitive, then open the meeting up to discussions of personal experiences and how to present this information successfully to vulnerable populations: real estate, residents in Candeles, CDPHE, and schools. The proposed Jefferson Parkway is high-speed private tollway that extends across Arvada from Broomfield to Hwy 93. Opponents raise concerns about a highway being built through Rocky Flats weapons-grade plutonium contamination east of the former nuclear weapons plant. Please attend this meeting for more information and an opportunity for public comment. Millions of dollars of taxpayer money have already been spent on this project, but no testing has been done along Indiana since the floods of 2013. Adequate testing must be done before this project goes forward. The board usually goes into Executive Session at the beginning of the meeting and the public must leave. At the December meeting, the public part of the meeting did not resume until 4 pm. So please attend, even if you must come late. The next JPPHA board meeting is Thursday, December 21, 2017 at 3:00 p.m. at Arvada City Hall located at 8101 Ralston Road, Arvada 80002. The meeting room is on the third floor. Visit the website: https://www.jppha.org/ for information about this proposed high-speed private tollway that is planned to extend across Arvada from Broomfield to Hwy 93. Opponents raise concerns about a highway being built through Rocky Flats weapons-grade plutonium contamination east of the former nuclear weapons plant. A recent class action lawsuit settlement (Cook vs. Rockwell) ruled in favor of plaintiffs whose property values were adversely affected due to the contamination. The weapons-grade plutonium has a half life of almost 25,000 years and is still present in these neighborhoods and along the proposed route of this private highway. But since the tollway is a private project, no testing is required. Please attend this meeting and learn more. Public comment is welcome. Panel Discussion on the proposed Jefferson Parkway. Panelists include Jon Lipsky and Pat Mellen. From the FB event created by Rocky Flats Workers: It's time again for the observance of the National Day of Remembrance for Nuclear Workers. We will be gathering at the City of Westminster, Armed Forces Tribute Garden. The event happens on October 28, 2017, kicking off at Noon. Please plan on attending this very patriotic event, honoring the men and women who worked at the Rocky Flats Plant doing such dangerous work to help fight and win the Cold War. Plan to be there ! Meet the film makers and join the discussion. Environmental Information Network (EIN) presenters will speak about Rocky Flats contamination, redistribution of contaminants, flawed monitoring, health risks of exposures then and now, and why it is vital to keep Rocky Flats closed to public access. This will be followed by an overview of the Jefferson Parkway that is proposed by the Jefferson Parkway Public Highway Authority or JPPHA. The head of the JPPHA stated at a recent meeting that there has been no testing, there will no testing, and no testing is required. This high-speed highway is planned to be built in areas contaminated by Rocky Flats. Lincoln Park on the State Capitol grounds (west side of capitol). Join Wes McKinley and all the Rocky Flats groups for music, food, and activities.